in the Costa Rica Jungle! 13 Zip Lines Through Primary & Secondary Forests! 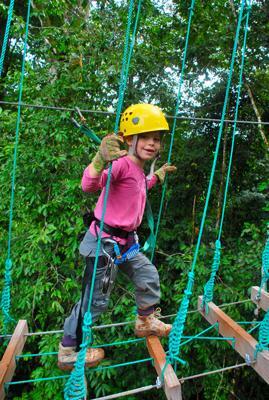 Treetop Suspension Bridges & Rappelling! Nature Trails And A Butterfly Garden! Abundant Wildlife Including 3 Species Of Monkeys! Snacks Or Dinner At Los Senderos Restaurant! Breathtaking Mountain And Valley Views! Only 5 min. from Manuel Antonio and Quepos! leaving you less time for other activities. Imagine yourself soaring high above the jungle floor as you fly through tree tops, amongst some of the most beautiful flora and fauna in the Costa Rican rainforest. The exhilaration of a zip line is, most likely, unlike anything you have ever experienced! With a perfect safety record and state-of-the-art equipment, the Titi Canopy Tour in Costa Rica is the only eco-friendly zip line that takes guests through primary and secondary forest tree tops among three species of monkeys. Our staff of professionally trained guides shows guests the abundant wildlife along the way; including titi, capucin, and howler monkeys, two and three toed sloths, poison dart frogs, iguanas and toucans. During your two hour journey, you will be perched on one of 16 platforms high above the jungle floor with dramatic views of the valley. A series of 13 zip line cables reaching up to 450 meters (1,475 ft) take guests throughout the unspoiled rainforest canopy on an exclusive tour that includes dramatic treetop suspension bridges and adrenaline-pumping rappelling. Breathtaking mountain and valley views can be captured while resting in a bungalow high upon the hill. Skillfully designed nature walks rivaling those found in Manuel Antonio National Park and a beautiful butterfly garden are all incorporated on the grounds of the Titi Canopy Tour. can be reserved in advance. Upon conclusion of your canopy tour, guests gather for drinks, fresh fruit and snacks. Additional beverages and appetizers are available at our restaurant, Los Senderos, which has a fantastic reputation for serving superb food that is specific to our region. While resting and refueling your bodies, guides will share photos of your exhilarating Titi Canopy Tour zip line adventure. A unique night time canopy tour can only be experienced at Titi Canopy Tour, and may be the highlight of a trip to the Manuel Antonio area of Costa Rica. Your adventure on a Night Canopy Tour begins after the sun dips into the Pacific Ocean and the unusual sounds of the rain forest come to life. All of your senses are engaged as you fly through the air with a veil of black that surrounds you. With safety as our number one priority, experienced guides will show you an incredible variety of nocturnal wildlife, while echos of magical chirps only heard at night come alive. Bright round eyes might stare back at you; belonging to a raccoon, olingo, kinkajous, four eyed opossum, sloth or anteater. At the conclusion of the Night Canopy Tour, guests are treated to a magnificent dinner at Los Senderos, one of the best restaurants in the area serving food unique to the region. With a perfect safety record, experienced guides, state-of-the-art equipment, and a thrill of a lifetime experience, we invite you to take a ride with us on the wild side! 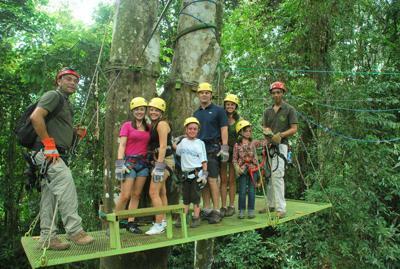 Following are the rates for the Titi Canopy Tour and Titi Night Canopy Tour. We look forward to reserving a space for you to experience the thrill of flying through the air while viewing some of the most stunning scenery, wildlife and plants in the tropical rain forest of Costa Rica. The Titi Canopy Tour includes transportation to and from your hotel in the Manuel Antonio or Quepos areas of Costa Rica. We also provide guests with water throughout the tour and drinks, fruit and snacks at the conclusion of your journey. The Titi Night Canopy Tour includes transportation to and from your hotel in the Manuel Antonio or Quepos areas of Costa Rica. We also provide guests with water throughout the tour and dinner at Los Senderos Restaurant at the conclusion of your journey. Located just minutes from Quepos and Manuel Antonio, Costa Rica, the Titi Canopy Tour is a perfect place to enjoy an experience of a lifetime. Please call to reserve your zip line adventure today!